Let’s face it, ladies, who doesn’t love a new pair of shoes? Whether it’s a beautiful pair of floral pumps perfect for spring or even just a new set of stylish sneakers for keeping casual on the weekends, a woman can never have enough shoes in her closet. But sometimes the budget doesn’t allow for us to buy every pair of our shoe dreams. Well, that ends today with the Macy’s Great Shoe Sale. 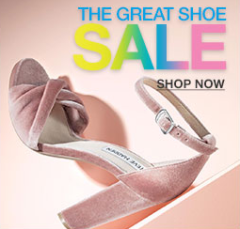 The beautiful thing about the Great Shoe Sale is that the more you buy, the more you save! 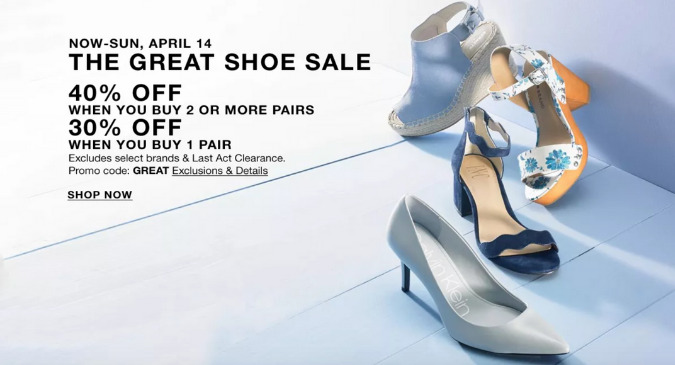 The good news is you have from now until April 14 to save during the Great Shoe Sale. Plus, don’t forget to sign up to get Macy’s Money with your purchase! How many pairs will you choose?